Storage can be beautiful! Take a look at these decorative ideas that will free up living space. When there just doesn’t seem to be enough room for the things you own, there is only one thing to do – go vertical. Going vertical is one of my professional organizer’s tricks for finding more storage. However, not every room can handle another tall piece of furniture. In that case, the solution is to use wall shelves. Decorative wall shelves, sometimes called floating shelves, can put storage right where you need it without making your room feel full. With some creative thinking, you’ll find using them brings much-needed storage. From creating a focal point to using them to hold your baby’s diapers, it is a great way to keep things you love or need within reach. 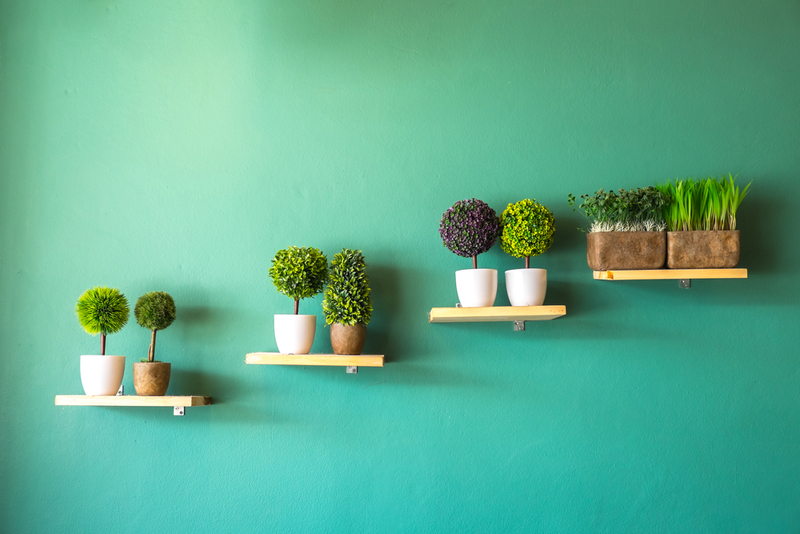 If you’re looking to save on space and keep things within easy reach, check out these eight easy ways to bring wall shelves into your home. Some lucky people have built-in focal points, such as a great view or cozy fireplace, to build their decor around. Others might have to find a focal point in a room that doesn’t come equipped with one. Wall shelves are a great way to create a fabulous, modern look that becomes the focus of your room. Shelves are a visually interesting use of space. Draw the eye in even more by varying the heights of the shelves or the types of items displayed. Most importantly, wall shelves allow you to put the items you love front and center without taking up valuable tabletop space. Build your own wall of organization at two of your home’s clutter hot spots—your front door or your back entrance. Hide a jumble of mittens, hats, umbrellas and jackets in plain sight by using a wall shelf complete with coat hooks. 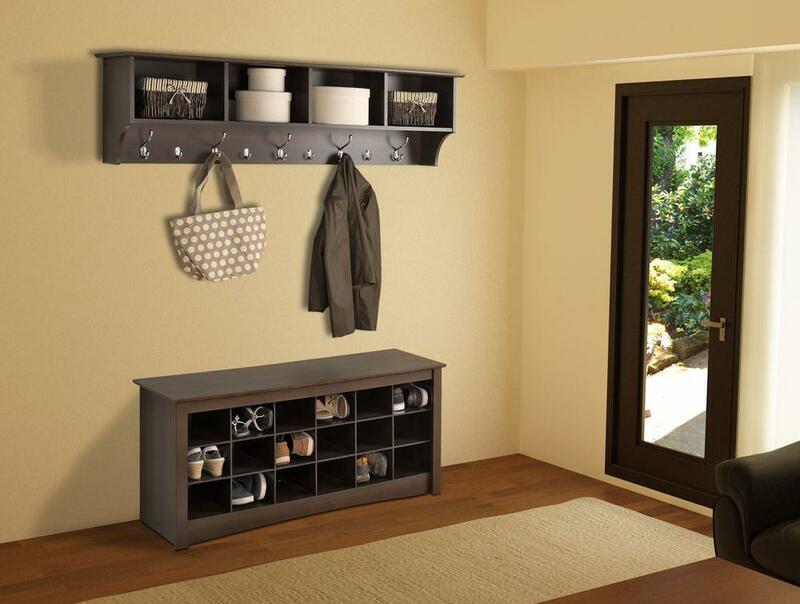 A narrow entryway that doesn’t have room for a piece of furniture is the perfect place to use vertical wall space. The shelves above the hooks keep frequently lost items, such as sunglasses and car keys, handy for heading out the door. Keeping things in sight but out of reach is the motto of decorating a baby’s nursery. Since it is often a smaller bedroom in the home, there may not be room for a lot of furniture. Floating shelves are a really great use of available space. 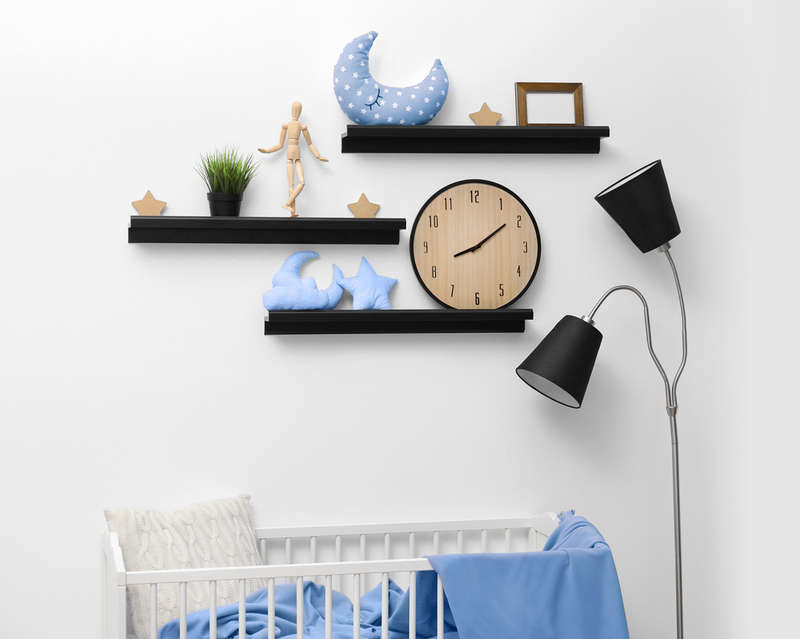 When placed above a crib, changing table or dresser—out of reach of the baby—these shelves can hold many things for baby to see but not touch. A treasured piggy bank, framed photos and decor that match the baby’s room are some of the items that might be displayed. Over a changing table, it can be a great spot for diapers and wipes. As the baby grows out of those, it can be used for decor or stuffed animals. The typical living room usually has an owner who collects something. A room you live in and love is the perfect spot to share whatever it is you collect, from framed family photos to a piece of pottery picked up on a vacation. However, a typical living room might not have much tabletop room. 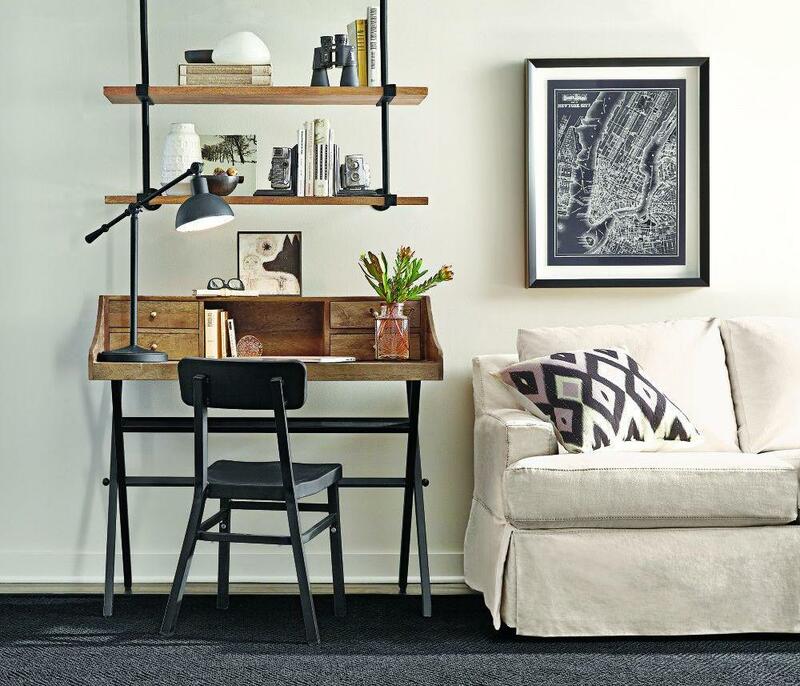 End tables with lamps, a busy entertainment center and a coffee table might be the only surfaces available. Filling them with items you love might just create clutter. Wall shelves give you display space that keeps your room looking peaceful and tidy. Modern kitchen design includes a mixture of cabinets and shelves. If you’ve got a bit of unused wall space, you can easily add some shelves for additional storage. The nice thing about open display shelves is you can use some of your favorite pieces as kitchen art. 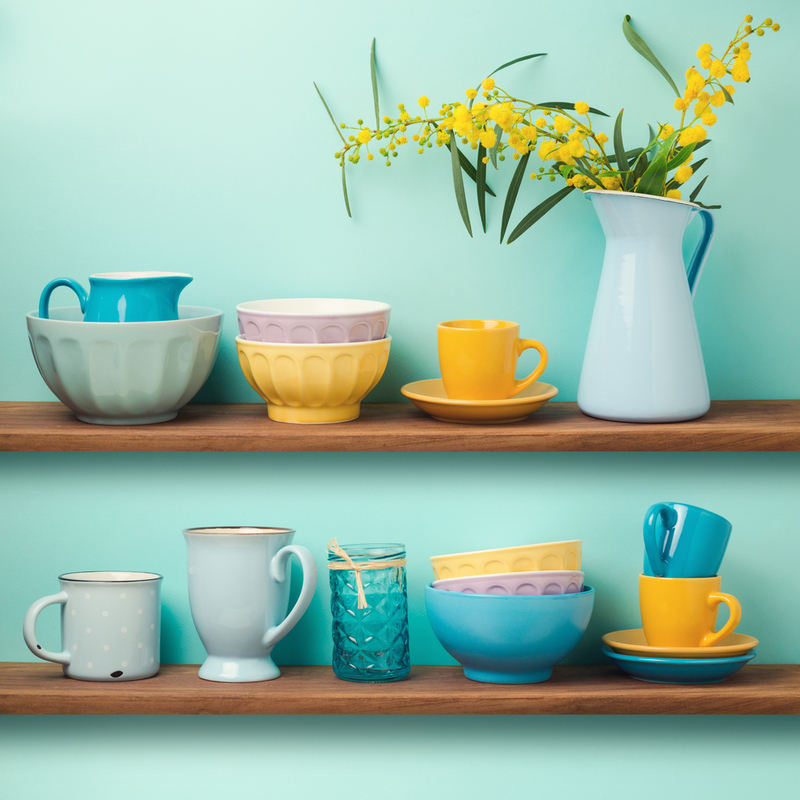 Storing interesting pottery, serving pieces, tea cups and platters in plain sight on open shelves looks terrific. Turn boring into interesting by creating a “headboard” using shelves. 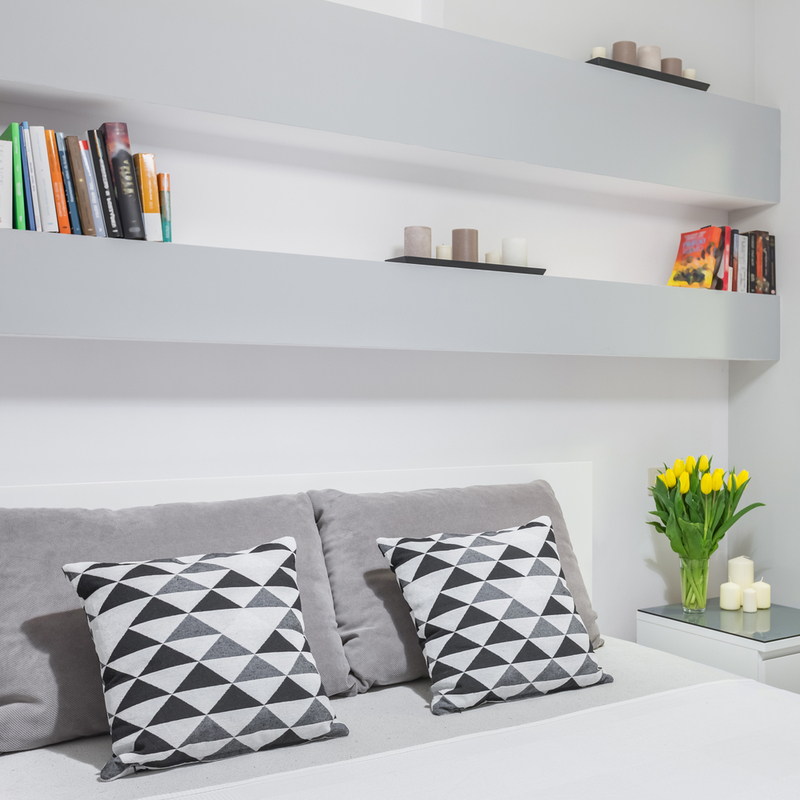 Instead of adding a headboard to your bedframe, create visual appeal by placing shelves over your bed. Long shelves running along the top of the bed make it a focal point. 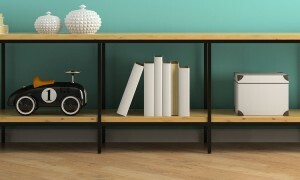 You can fill the shelves with items you love or with decor to match your room. Or, you can keep them simple by adding small lamps and an elegant piece of art. With flat-screen TV’s, there isn’t always the need for a big entertainment center. 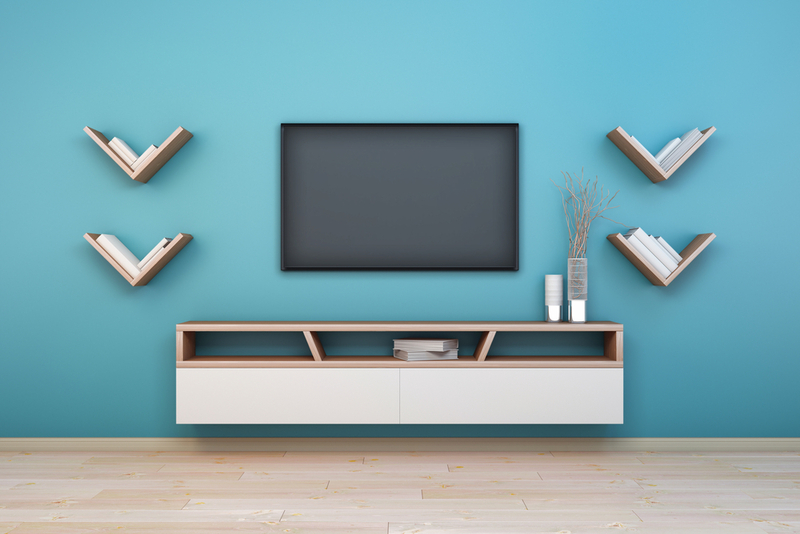 Use wall shelves to mimic the idea of one—they can hold a wall-mounted TV or its components. Or, you can use a long shelf much in the way you’d use a fireplace mantle. Mount the TV over the long shelf and then decorate the shelf like you would a mantle. Working from home, even occasionally, means turning around and reaching for something you need that’s not at your fingertips. Increase your desk-area storage by installing shelves above the desk. These can be used to hold office supplies, binders and reference materials. Decorative storage boxes are great for keeping supplies handy but hidden. The key to making wall shelves work for your home is to decide first what they will hold. This way you can determine the size of the shelves, location and spacing. Armed with this information, it is easy to find just the right shelves to give you the storage you desire. Lea Schneider is a professional organizer who writes for The Home Depot. 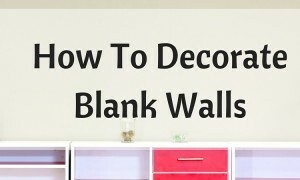 She offers some great tips on decluttering your spaces by adding shelving to your walls. 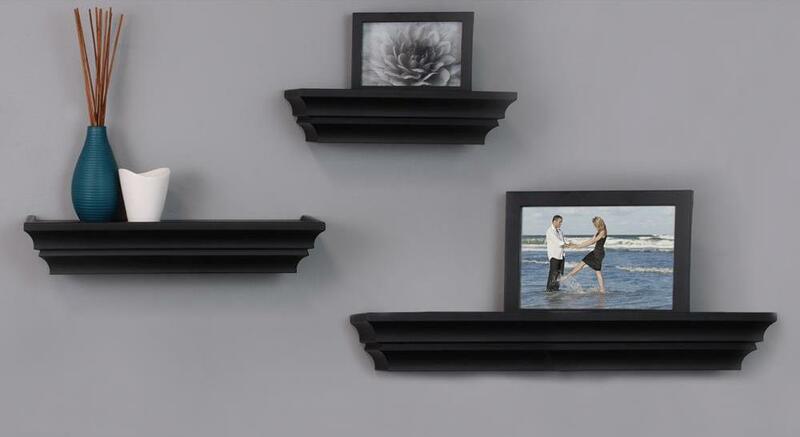 Once you have those shelves up, visit The Home Depot to find lots of wall decor options to add some style to them.